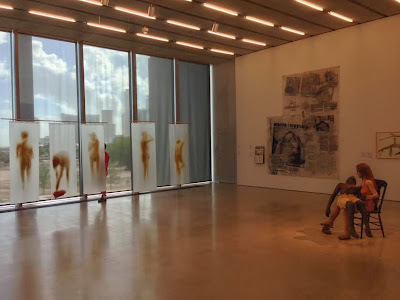 at the Perez Art Museum, Miami. Photo by John J. Tackett for The Devoted Classicist blog. 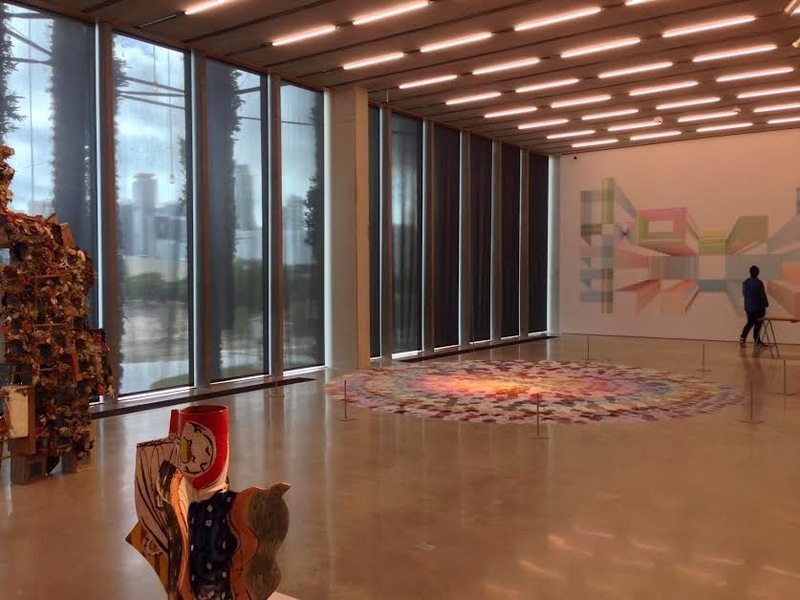 Just one of the treats during the holidays in the Miami area was a visit to the new Pérez Art Museum, also known as PAMM, which had its official grand opening just this last December. I was taken by my art collector friends Ian and Hector, who are Founding Members. 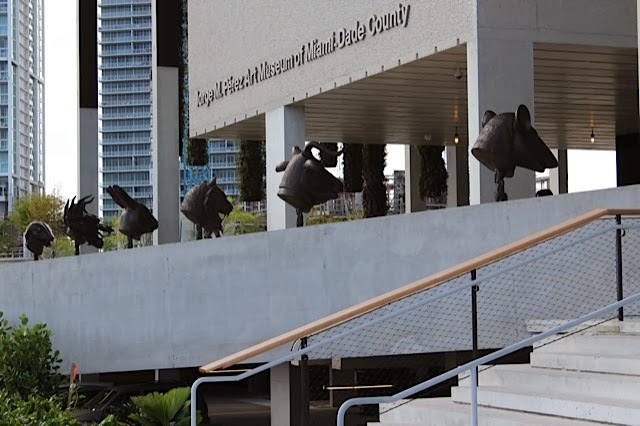 A rendering of the entrance elevation of the Perez Art Museum Miami. Designed by the Pritzker Prize-winning Swiss architects Herzog & de Meuron, the building is hurricane-reistant with a wide, shaded deck beneath a three-story slatted roof ornamented with hanging columns of plants watered by recaptured rainwater. 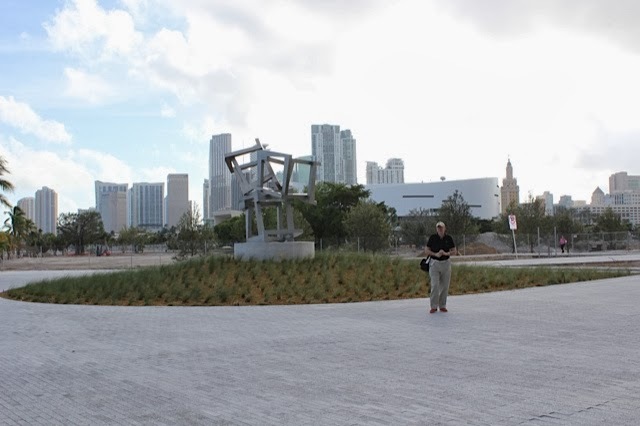 The design is said to be an homage to early Miami structures built on stilts, and that may indeed be the inspiration. 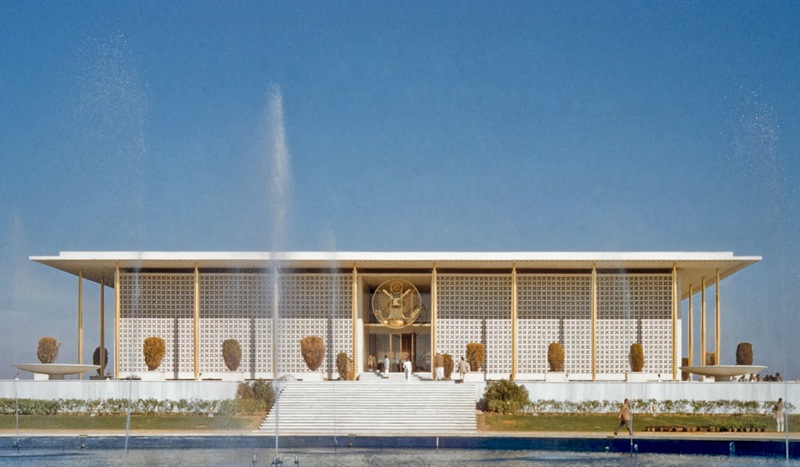 However, The Devoted Classicist sees a clear reference to the U.S. Embassy in New Delhi designed by Edward Durell Stone. Image: EDWARD DURELL STONE . .
Construction work is still underway for a neighboring museum and a new landscaped park. At present, visitors arriving by foot (there is a nearby stop of the Metromover, the free monorail system), taxi or limousine (and eventually, yacht) are directed to a vast paved cul-de-sac and may ascend a short flight of stairs to the main entrance. as it appeared late December, 2013. Photo by Hector Alexander for The Devoted Classicist. The entrance is rather modest, as such things go. The three pairs of wood plank doors are more like what would suspect from a contemporary church rather than a temple of art and beauty. 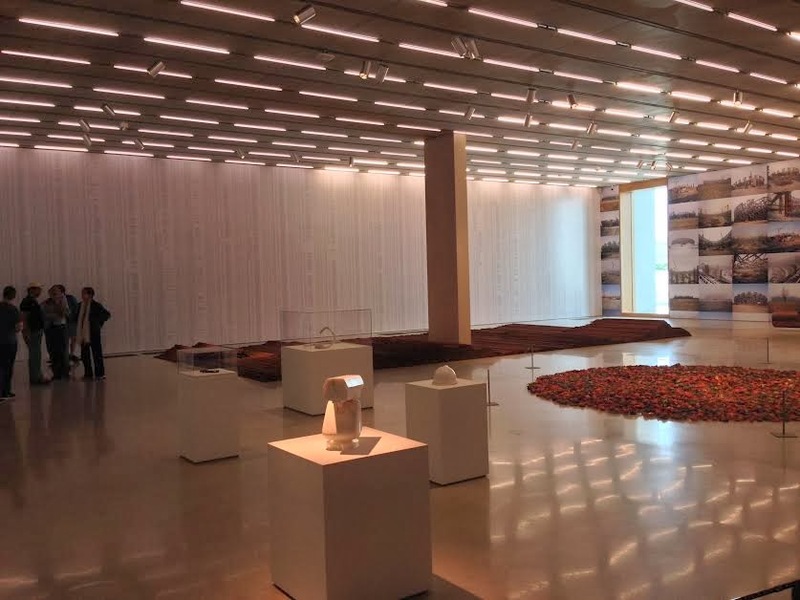 But that is one of the first hints that the building is designed to be democratic and accessible to all (there are some free admission times). The main entrance to the Perez Art Museum. 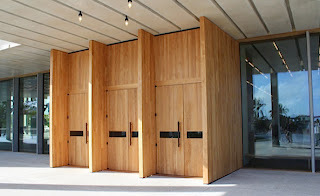 The main entrance doors at the Perez Art Museum. 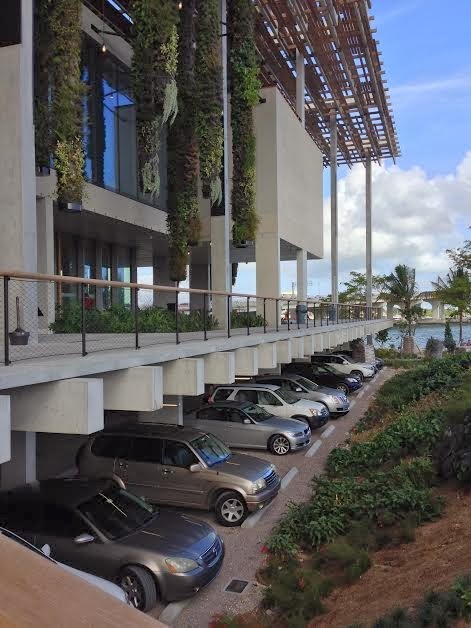 Visitors arriving by private car may park underneath the museum at a ground-level garage paved in gravel and limited areas of pervious concrete. The parking is shielded by landscaped berms. The available space is limited and relatively pricey, however; it could never absorb the traffic generated by a special event. The parking below the Perez Art Museum. 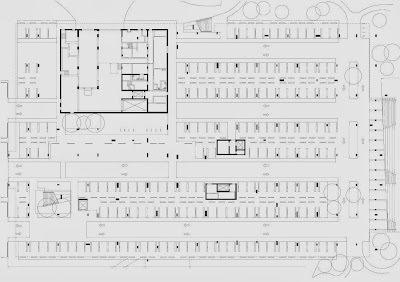 A plan of the Ground Floor shows the parking, elevators for handicapped access, and mechanical space. 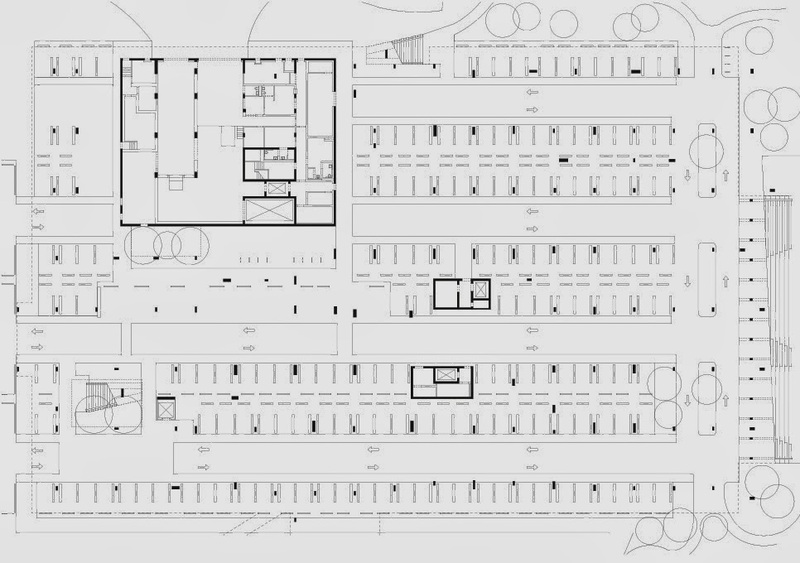 Ground Level Plan of Parking. via A F A S I A. 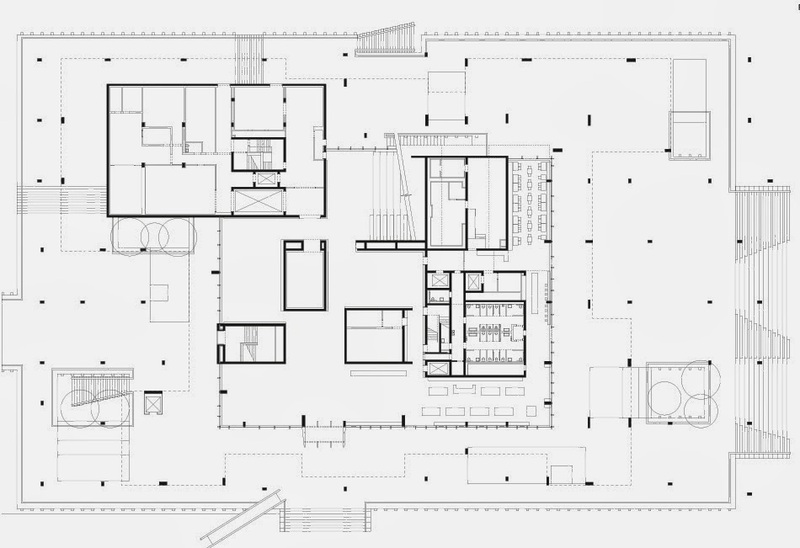 The main entrance, shown near the bottom of the Main Floor Level plan, opens into a relatively tight and unassuming space with the admissions desk to the forward right and an open-plan gift shop to the right of that. 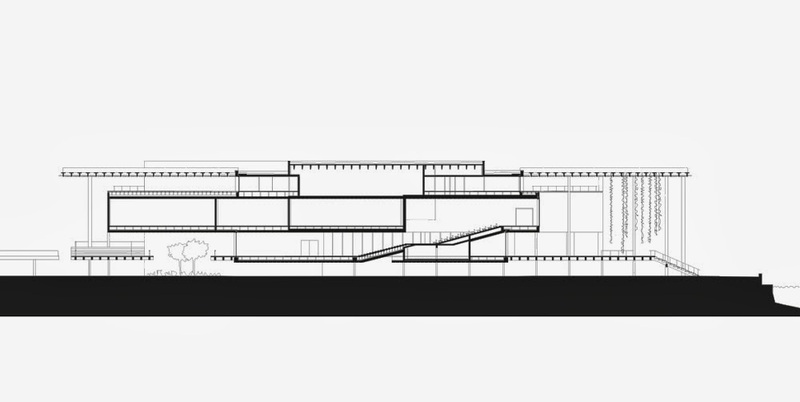 A gallery space is immediately to the left, but access to the other galleries on this level is unassuming. One might think he is going the wrong way; it could be argued that there is not a logical flow. There is no grand staircase to the upper level galleries, but one can ascend the risers in the open theatre space or take a small elevator. 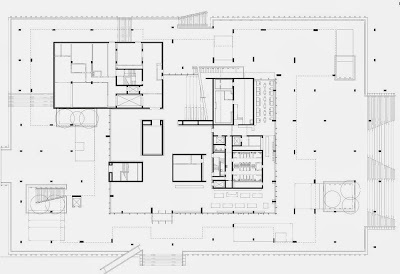 The building section indicates the theatre which can be used for various purposes. One of the galleries, currently featuring the natural vegetation of the area, displays a life-size representation of a conservator's van. 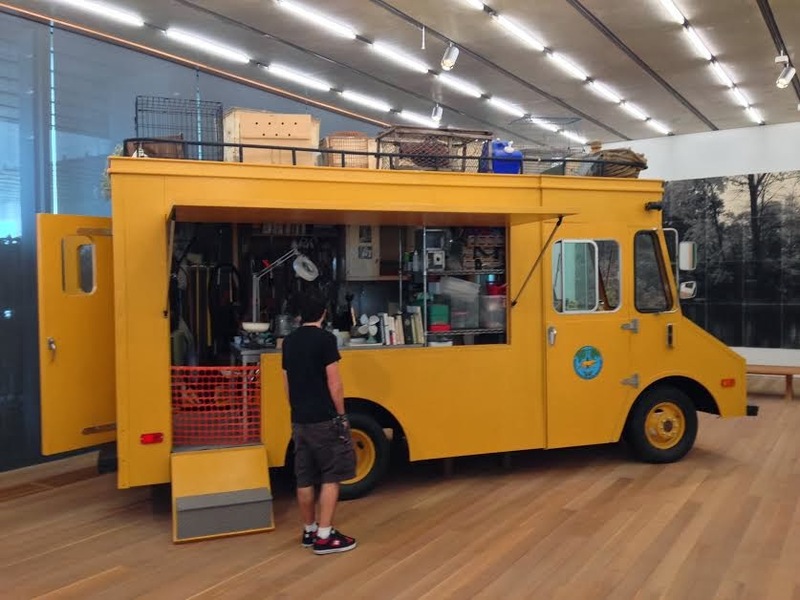 It is not a real van, but an artistic construction of a van. does not have a removable lens. All these shots are by iPhone. 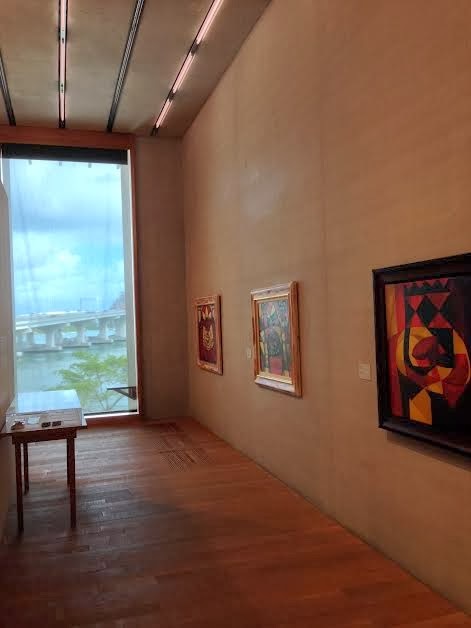 One gallery displays what might be more thought of as traditional museum art, that is, oil and/or acrylic paintings on canvas. 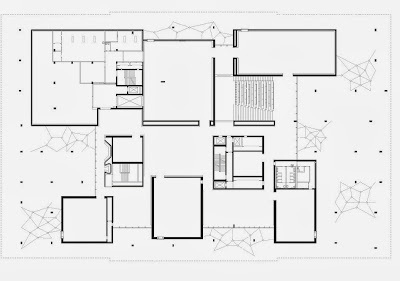 In the photo below, typical construction details may be seen with the harsh interior concrete walls and florescent strip lights in the channels of the concrete ceiling. The floors in this gallery end with a reveal at the wall and are slightly rough-sawn with minimal or no finish; this results with an effect that it is dirty, which it probably is. features a pair of perch-like seats. 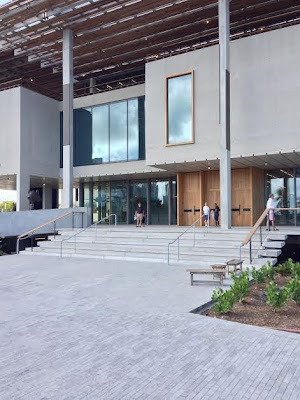 The museum building was named as a result of a $40 million gift of cash and art by Columbian-born developer Jorge Pérez, the son of Cuban exiles. These naming rights have been controversial, to say the least, causing some of the museum trustees to resign in protest. 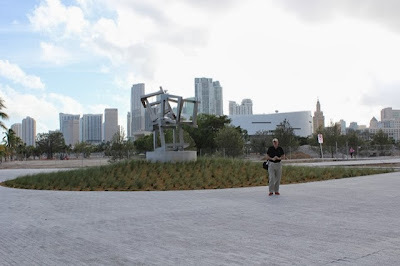 But there is no doubt that Mr. Pérez is a strong voice in the urban redevelopment of Miami, currently well underway in becoming a major international city. 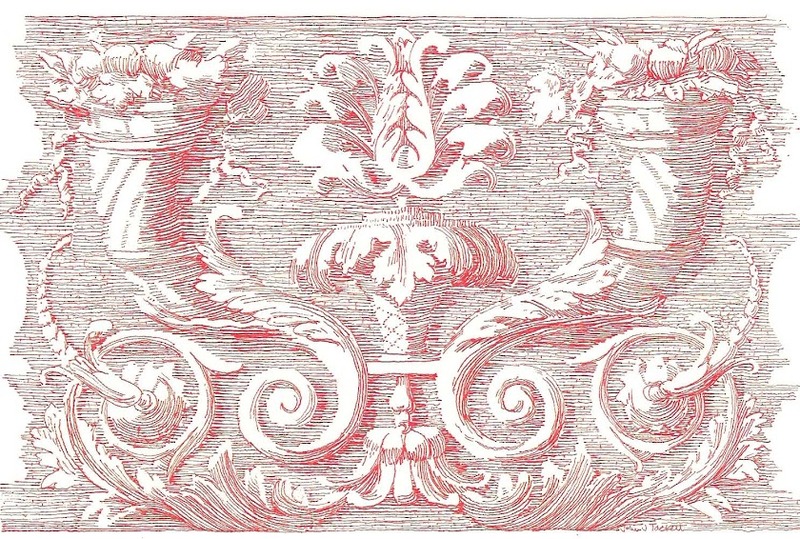 A design of colored string decorates the wall of one gallery. Although much of the art has a Latin influence, it is obvious that there is an attempt to appeal to a broad audience, often showing art created from very humble materials and/or found objects. 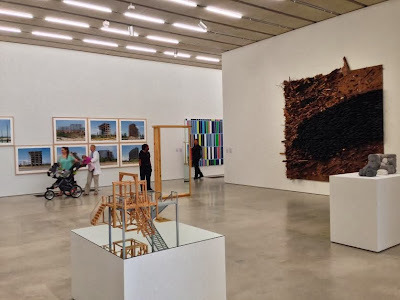 An upper gallery at the Perez Museum of Art. Miami. but painted gyp board walls. 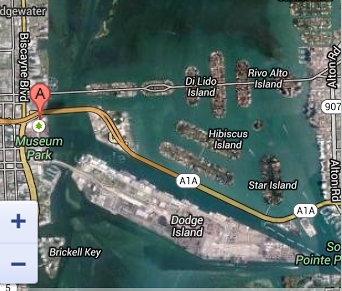 The "A" marks the location of the new museum. 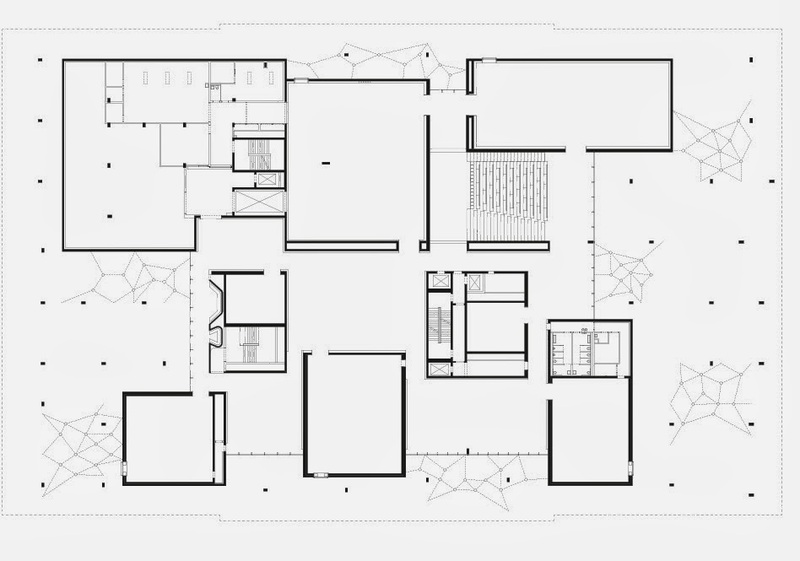 Any home dedicated to art is appreciated and the effort to give a nod to local environmental forces and vernacular buildings ranks high on The Devoted Classicist's architectural scorecard. It will take more time to evaluate how well it works, however, but a visit is encouraged so Devoted Readers can decide the success for themselves.